If you read this blog often, you'll notice a recurring theme: we regularly compare online marketing to a chain in which all of the links need to be strong. We also refer to it as a puzzle or a machine in which every part or piece matters. And every part does matter. You need every piece of your online marketing apparatus working to help you reach a goal. That goal is converting website visitors into buyers. Online marketing is competitive, and it's easy to lose sales you “almost had”. So you want to give yourself every possible advantage. Your website needs to be a “hub” or “anchor” for your business. This is the case when you are running a B2B site where you attempt to drive traffic through your funnel by persuading visitors to download your latest white paper or register for your latest webinar. It's also true when you are running an e-commerce store where your goal is to sell the visitor now! Are You Overlooking This Golden Opportunity? Every page on your website needs to be optimized for conversion-friendliness. One page that's often overlooked as a potentially powerful conversion tool is the “About Us” page. Many website owners miss out on a load of golden opportunities to win new customers because they don't optimize their About Us page to make it an effective conversion tool. Your About Us page can do a lot of the “heavy lifting” in your site's effort to convert more of your readers into customers. People tend to buy from those they know, like and trust (a cliché, but it's true); this all-important page can make your readers feel like they know you, they like you and they trust you enough to part with their money and become your customer. People respond to stories. It's almost like we are wired that way. So by all means, use your About Us page to tell a story that will hit an “emotional home run” with your readers. But always use your About page primarily as a way to tell your reader how you can and will benefit him. Also, remembering that your reader may very well be stressed out, busy and distracted while he's on the web, and remembering that he doesn't want to work hard to find out about you, make your “About Us” page easy to read. Make it simple and uncluttered. In a moment, we'll talk about a real life About Us page example from a legendary marketer. I'm confident you'll be able to gather specific ideas to make your own About Us Page more conversion-friendly. Even though it's called your “About Us” page, make it more about your reader than you, if you want it to help your site convert as much as it possibly can. Someone who does this extremely well is legendary direct response marketer Dan Kennedy. Dan is the founder of Glazer (in honor of his now retired partner Bill Glazer) Kennedy Insider Circle. His company provides top-notch marketing training services and information products for small businesses. His About GKIC page provides a wonderful example of how to use an “About Us” page as a very effective conversion tool. People are prone to pay attention to and respond to stories. Smart marketers like Dan and his team understand this. Notice how the headline at the top of his About page is “The GKIC Story”. It doesn't say “About Us” , it promises the reader a story. Ironically, Dan's “About GKIC” page is much more about the reader and how he can benefit from doing business with GKIC than it is about Dan, his company or his products. Also, notice how the only graphic image the page has in the body of the content is directly related to the written message; it helps strengthen the message. Further down the page, the copy preemptively addresses a concern some readers may have. They may be feeling overwhelmed and scared about trying out this new marketing system (marketing is something many small business owners fear). At the bottom of the page, there is a strong call to action with a link that takes the reader to a simple, uncluttered landing page with an attention-grabbing video and a very strong, benefit-rich headline and sub-headline. Keep in mind that Dan Kennedy is one of the world's wealthiest, most successful copywriters and marketers. He and his team have a deep understanding of direct response marketing. Studying, learning from and emulating very successful marketers like Dan is a wise strategy. Remember that your “About Us” page needs to help you in your efforts to convert more readers into buyers. Apply the same proven tactics you would use on other parts of your online marketing here. You are selling the reader on doing business with you. And at some point, he requires proof. So give it to him. Use testimonials, including video testimonials from your very happy customers. We've done this at Lander. Our version of an “About Us” page has the headline “Why Lander”, and we use it to talk about the benefits our customers can expect. On the page, we leverage the power of two testimonials from very happy customers. And we display the logos of leading companies that trust Lander. To sum up our talk today, use every page on your website, including your About Us page to help you convert more readers into buyers. Use your About page to build momentum that will lead to more conversions. Once you have built this “snowball of momentum”, and it's rolling downhill and gaining speed, you need a solid landing page. To enjoy maximal conversion rates, you need landing pages with every detail down pat. Your landing pages need persuasive copywriting, conversion-friendly design and a strong, compelling offer. And wouldn't it be nice if you had Lander, the world-class landing page platform engineered to help you enjoy a higher conversion rate? 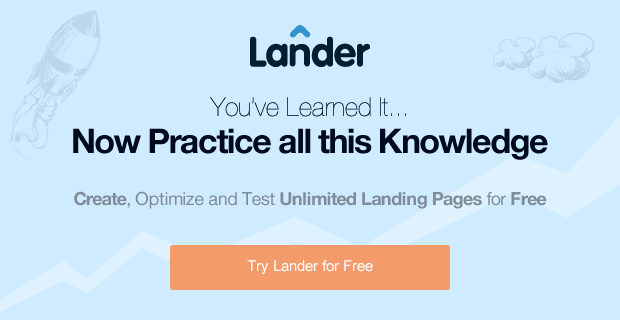 Lander is the landing page platform trusted by leading companies like Cisco and Capcom. It's the landing page platform that's a snap to set up and maintain. Well, you can have Lander, starting today. And here's some great news! You can try any of our benefit-rich landing page templates free for up to 30 days. You'll love how our cutting-edge landing page platform can help you launch your online marketing results into the stratosphere!